PROSPERITY BEGINS WITH A POP SO USHER IN A VIBRANT CNY WITH CARLSBERG’S COLOURFUL CANS AND BOTTLES! “Prosperity Begins With A POP!” this festive season as electronic mahjong tables, mahjong sets, beer vouchers, RM100 cash ang paus, cooler bags and much more are up for grabs! 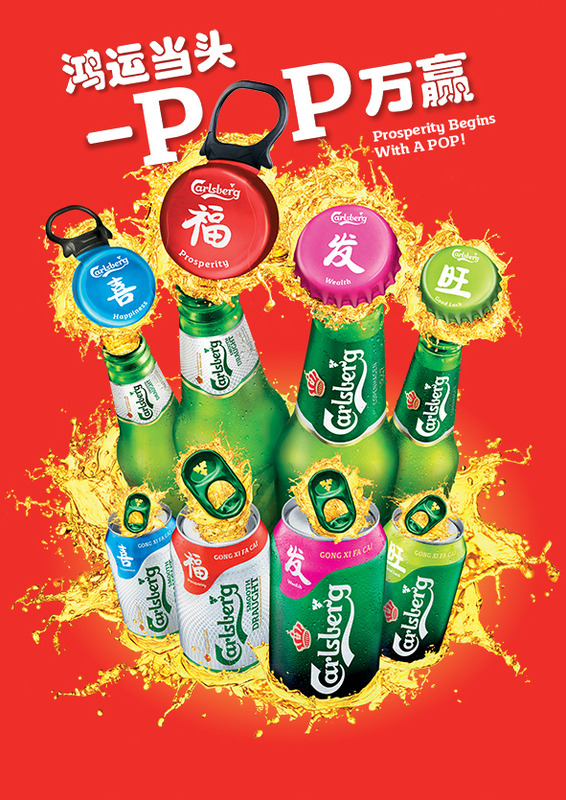 Carlsberg is putting a vibrant twist to the traditionally reddominated festival by giving a colourful spin to this 2019 Chinese New Year (CNY) with “Prosperity Begins With A POP!” promotion. 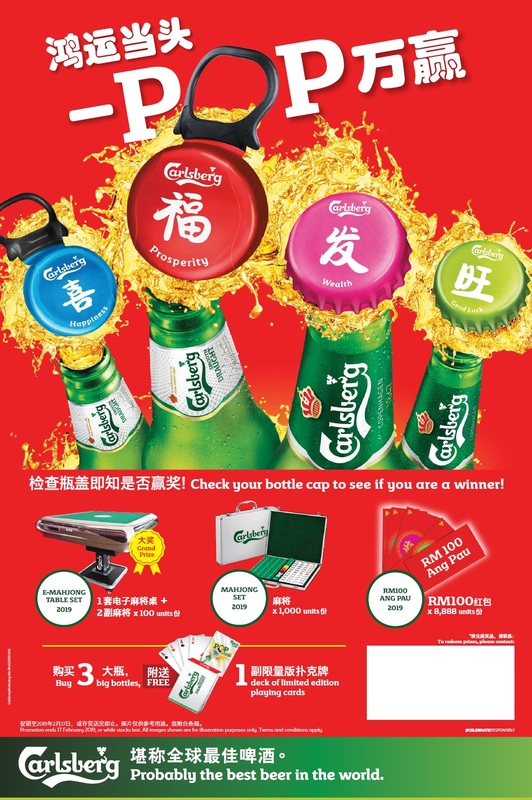 Introducing 4 vibrant coloured caps and cans in red, pink, green and blue, beer lovers can spot Carlsberg and Carlsberg Smooth Draught’s CNY limited edition festive pack easily and stand to win exciting prizes including electronic mahjong table, mahjong sets and cash ang paus! Bringing the vibrant CNY festive spirits to life, all big bottles of Carlsberg and Carlsberg Smooth Draught are spotted in red, pink, green and blue caps with greeting words of 福 ， 发，喜 and 旺 symbolising Prosperity, Happiness, Wealth and Good Luck! The same vibrant colours and greeting words are also spotted on Carlsberg and Carlsberg Smooth Draught 320ml festive can packaging. Carlsberg’s Prosperity Begins with a POP! nationwide promotion commenced on 24th December 2018 and runs till 17th February 2019. So hurry and enjoy Carlsberg and Carlsberg Smooth Draught NOW and stand a chance to win 100 fantastic grand prizes consisting of electronic mahjong table sets that auto shuffles and sorts the game tiles that comes in two sets for convenience and hassle-free enjoyment! Other exciting prizes like limited edition mahjong sets, RM100 ang paus and playing cards are up for grabs too! All you need to do is check the winning icon under the bottle caps for these amazing prizes! Back by popular demand for the third consecutive year, there will be 103 sessions of Carlsberg’s “Probably The Best CNY Shopping Experience – You Shop, Carlsberg Pays!” set to be held at participating supermarkets and hypermarkets on 30 December 2018 and 5, 6, 12, 13, 19, 20, 21, 24, 26 and 27 January 2019. Consumers who buy any Carlsberg Malaysia products worth RM200 can stand a chance to win the Grand Prize of having your groceries worth up to RM 800 all-paid-for by Carlsberg. That’s not all. You can also look out for other fabulous prizes like FREE BEERS up for grabs! Try your luck now and visit the nearest AEON, AEON BiG, Billion, City Grocer, Cold Storage, Everrise, Giant, HeroMarket, Nirwana, Pacific, Servay, Sunshine, Ta Kiong, Tesco, TF ValueMart, The Store and Tunas Manja for these amazing promotions! 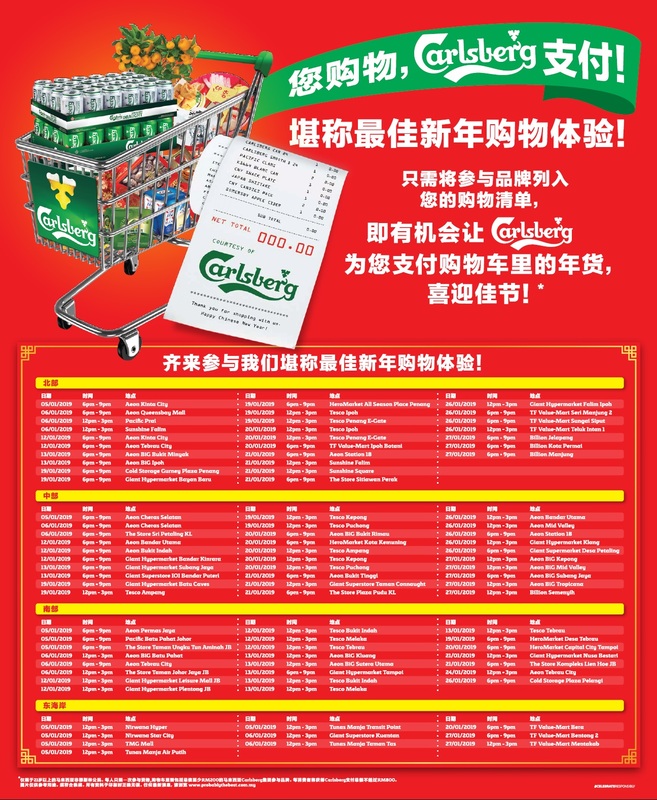 Or, head down to Tesco that is giving away FREE Mahjong sets when you buy RM600 worth of Carlsberg Malaysia products. Getting your supply from 7-Eleven? Stand to win an Electronic Mahjong Table OR take home a RM100 Ang Pau when you spend RM20 and above worth of Carlsberg, Carlsberg Smooth Draught, Kronenbourg 1664 Blanc, Somersby Apple and Blackberry. Start enjoying Carlsberg and Carlsberg Smooth Draught NOW and take advantage of these abundant and fantastic offers to celebrate a vibrant and happy Lunar New Year! For more info and terms and conditions, check out www.facebook.com/CarlsbergMY or visit www.probablythebest.com.my. This entry was posted in News and tagged 2019, beer, Carlsberg, chinese new year, cny by TheGoodGoodGuy. Bookmark the permalink.